Browse: Home / Time to Believe in Hell Again? Mike Stone makes the case for believing in everlasting punishment for our sins. I’m not interested in whether religious beliefs are true, I judge them solely on the basis of their effect on our behaviour and happiness. Does hell exist? We’ll find out soon enough. In the meantime, if believing that it exists saves us from hell on earth, I’m all for it. Have you ever seen the documentary “Scared Straight!”? In it, a group of juvenile delinquents are taken to Rahway State Prison for a three-hour session with actual convicts in which the convicts proceed to “scare the kids straight” with terrifying tales of life behind prison walls. The kids are screamed at, cussed at, and threatened with violence, all in an attempt to get them to change their ways. And apparently, the approach works as only one of them ended up in prison later. Fear can be a great motivator. 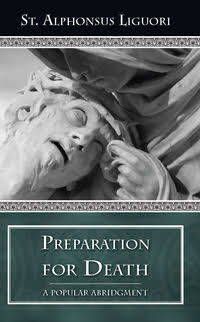 The book “Preparation for Death” by St. Alphonsus Liguori will have the same effect on you concerning hell as the convicts did on the delinquent kids in “Scared Straight!”. This book, which I can’t recommend more highly, paints a terrifying picture of the afterlife for those who disobey God and reject Him. One of the main points of the book is that hell is eternal. Think about that for a moment. Eternal. Burning alive in fire, inhaling the putrid smell of dead carcasses, and hearing the howls and wails of tortured souls forever and ever. There is no preparation of death I would have to posit. We posit we presume, we ponder and yet even by our own hand we are no cartographer. There is no, there was no map O’mans design………. PS. let me warn ye….We are but the ink O’da pen of a greater hand. Much greater than we as we cast our worldly goods to the world of the worm..Better ye that let the dog lick the sore of the tramp at the rich mans gate. The pen mayhaps is really greater than the sword.